International Teachers of Pop are, in fact, three Sheffield-based students of analogue-synth with long histories in the Steel City’s indie scene: the Moonlandingz’s Adrian Flanagan and Dean Honer (also of Eccentronic Research Council) helm the electronics with similarly unflashy dedication to teutonic pulse as heard in their main band, while Leonore Wheatley provides more of the deliciously detached froideur she offers with The Soundcarriers. Drop in splashes of early-80s new-pop melodrama and an impressive line in playground sing-song melodies, and you get a collection – on the album’s first half, at least – of perfectly serviceable Human League impressions, which, given Flanagan’s assertions that this is the “third most important outsider pop album to come out of Sheffield after ‘Dare’ and ‘Different Class’”, perhaps represents a job well done. The album’s second side, however, broadens and slows, revealing something far more interesting than mere retro-pop fetishism: ‘She Walks In Beauty’ has a lovely phasing quality, its pack of synths beavering away separately but together, and album closer ‘Oh Yosemite’ verges on the balladeering – pleasingly dreamy, bored, and full of longing. ‘The Age of the Train’, meanwhile, is the best thing here, a sinewy, slithering and sinister diatribe against Northern Rail’s calamitous timekeeping that perhaps comes closest to the band’s stated aim of offering “pure escape from your Brexit nightmare”. 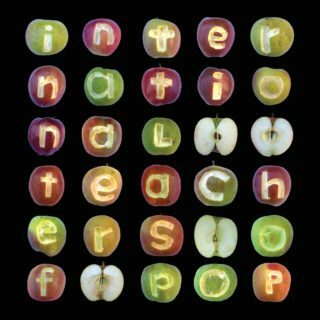 That ‘International Teachers of Pop’ doesn’t quite meet that ambition is no cause for embarrassment; that it nonetheless offers a satisfyingly nostalgic respite from the harshness of 2019 is success enough.